Donald Trump has yet to announce his preference for two-thirds of his cabinet slots including some of the most high profile department heads, but his selection of Dr. Ben Carson to lead the Department of Housing and Urban Development made headlines on Monday – and Carson’s name, with confirmation expected by the U.S. Senate, could be added to a very short list in modern political history. The retired neurosurgeon was one of Trump’s 16 opponents for the Republican nomination in the 2016 cycle – and one of three political outsiders along with Carly Fiorina. Carson was early to endorse Trump after his March 4th exit from the GOP race – doing so just one week later. And while it has not been uncommon for competitors of a party’s presidential nomination to be selected as running mates (e.g. Lyndon Johnson in 1960, George H.W. Bush in 1980, John Edwards in 2004, Joe Biden in 2008) – it has been very unusual to fill out the president’s cabinet with such failed political rivals. 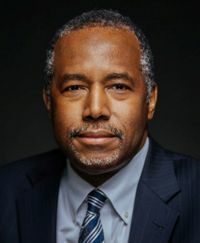 A Smart Politics review of the 408 department heads selected since the William McKinley administration finds that only six had challenged the president for his party’s nomination, or 1.5 percent; Ben Carson would become the seventh. [Note: Included in this analysis are heads of the following departments: State, Treasury, Defense, Justice, Interior, Agriculture, Commerce, Labor, Health & Human Services, Education, Housing & Urban Development, Transportation, Energy, Veterans Affairs, Homeland Security, Health, Education & Welfare, Commerce & Labor, War, Navy, and Post Office]. After his 2008 victory, Barack Obama undertook the unusual step to nominate not one but two former challengers for his party’s nomination to head up executive departments. The most high profile, of course, was chief rival Hillary Clinton who served as Secretary of State for four years (2009-2013). Obama also chose former Iowa Governor Tom Vilsack to be Secretary of Agriculture (2009-present) – the only department head to remain throughout the entirety of Obama’s two terms. Vilsack ran a brief 86-day campaign for the Democratic nomination from November 2006 to February 2007 and exited the race 13 days after then Senator Obama joined the field. Prior to Obama, it had been 20 years since the last time a cabinet pick was selected from the pool of formal rivals by a president or president-elect. In 1989, Jack Kemp was confirmed as Secretary of Housing and Urban Development under George H.W. Bush, where he served for all four years. Kemp’s failed bid for the Republican nomination lasted almost a year – from April 1987 to March 1988. The first department head since the McKinley administration to have challenged the sitting president for the nomination was U.S. Senator Philander Knox in 1908. Knox’s name was formally placed into nomination at the Republican National Convention by Pennsylvania Lieutenant Governor Robert Murphy, and received the support of 68 delegates in the first and only round of balloting won by Secretary of War William Taft. Knox came in second place with 64 votes from his home state of Pennsylvania and four from New Jersey. The former U.S. Attorney General later became Taft’s Secretary of State on March 5, 1909 and held the position for the entirety of Taft’s term. Twelve years later, Warren Harding selected Herbert Hoover to become Secretary of Commerce, where he served from 1921 to 1928. Hoover received double-digits in six states during the 1920 Republican primaries: Michigan (12.8 percent), Wisconsin (13.0 percent), Montana (12.6 percent), California (36.1 percent), Vermont (10.8 percent), and Oregon (12.1 percent). Hoover received votes on each round of balloting at the GOP convention, and peaked at 9.5 delegates from six states during the 10th round (good for sixth place). Forty-eight years later, Michigan Governor George Romney was picked by Richard Nixon to head the Department of Housing and Urban Development, where he served for four years (1969-1973). Romney formally launched his presidential bid in November 1967 – two and one-half months before Nixon. Romney did win the support of 50 delegates at the RNC in August for a distant fifth place finish. The Michigan governor won 44 of the 48 delegates from his home state and six of eight from Utah. All told just six of the 408 department heads from McKinley through Obama had challenged the president for his party’s nomination. In addition to the names mentioned above, presidents have at times nominated the spouse of a former rival to head up a department. For example, Elizabeth Dole ran Reagan’s Transportation department from 1983-1987 and then George H.W. Bush’s Department of Labor from 1989-1991. Bob Dole launched failed campaigns against Reagan and Bush in 1980 and 1988 respectively. Previous: Just How ‘Popular’ Was Hillary Clinton? 1 Comment on "Ben Carson Is Just 7th Presidential Rival Chosen to Head Executive Department in 120 Years"